If one attempted to select a hotel at random in Florence you would be defying the odds if the choice was anything other than historic. And in the Hotel Degli Orafi you would prove the point: a 13th century example of Florentine architecture. Indeed, parts of it - such as the restored tower - predate that. Don’t be too surprised if you recognise the place, either - it was the setting for Merchant Ivory’s Oscar-winning film, Room with a View. 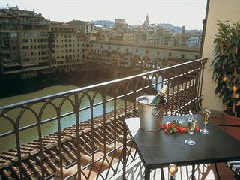 Located right by the Uffizi Gallery and opposite the Ponte Vecchio, Hotel Degli Orafi is 4-star rated and offers a total of 42 guest rooms. These include junior suites and the aforementioned “Room with a View” on the fourth floor of the building.